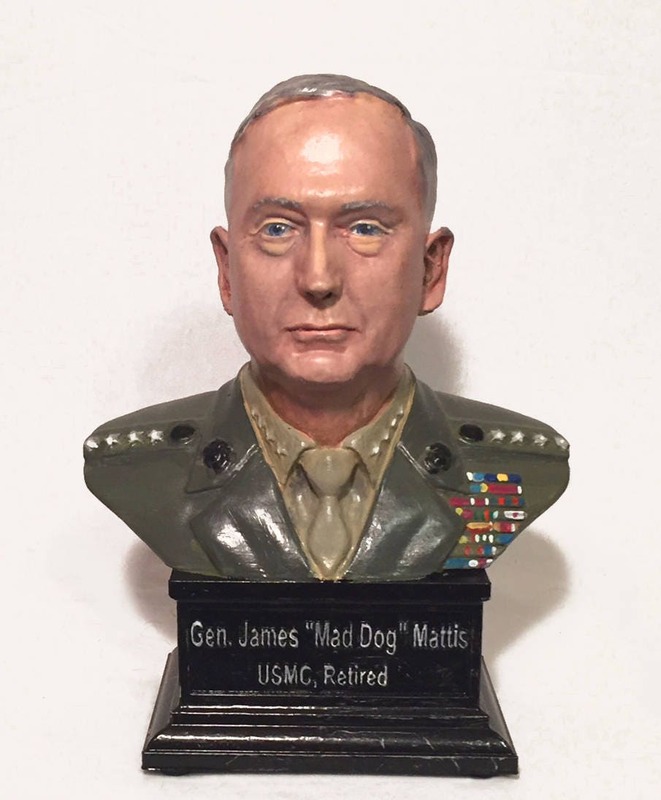 This is a Hand-painted 3D Printed Polished Vinyl sculpture of General James "Mad Dog" Mattis USMC Retired. 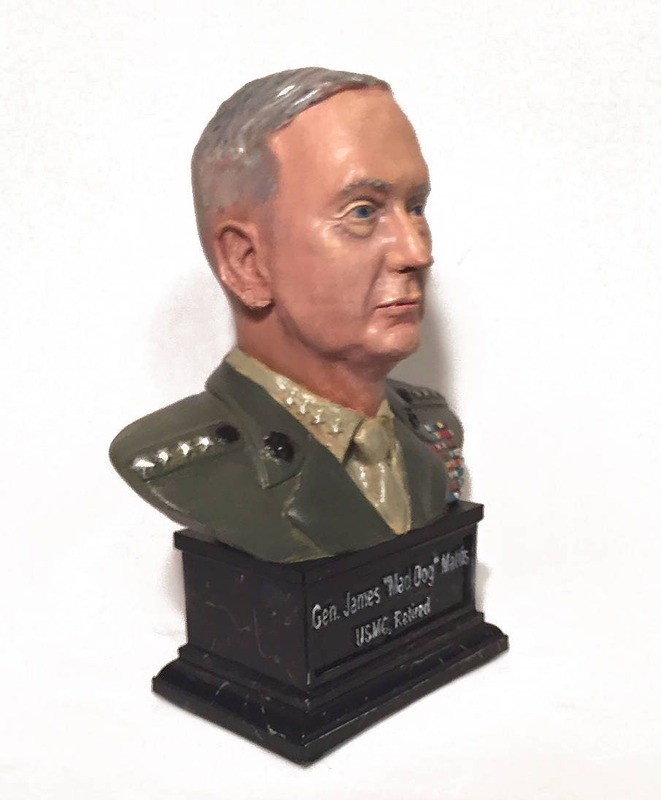 He is our current Secretary of Defense and arguably one of the best military tacticians in history. 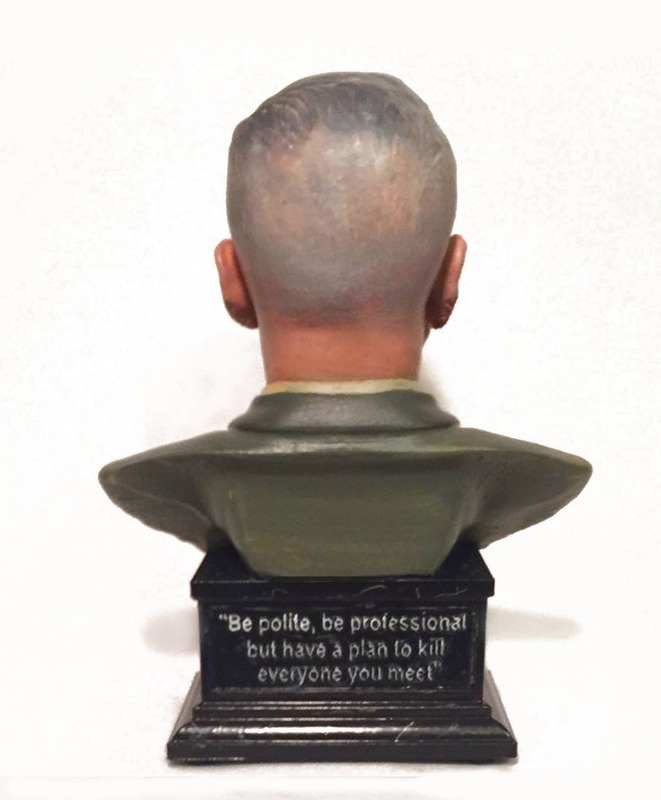 This model is unique in that it was sculpted from scratch to include every last detail down to his Alpha Uniform insignia. This is version hand painted in acrylics by Luther Berry Designs in a team effort. He clear coats the acrylic after painting to give it a lasting finish. Please allow 3-4 weeks processing to print, polish, dry, and then hand paint the piece. This is truly a work of art! A black or white faux marble can be applied to the base with black shown in the pictures. It stands 3 inches long, about 7 inches tall, and 5.5 inches wide. If you'd like a larger model hit the "request custom order" and I'll work up a quote to your specifications. and my all time favorite: ""PowerPoint makes us stupid."" 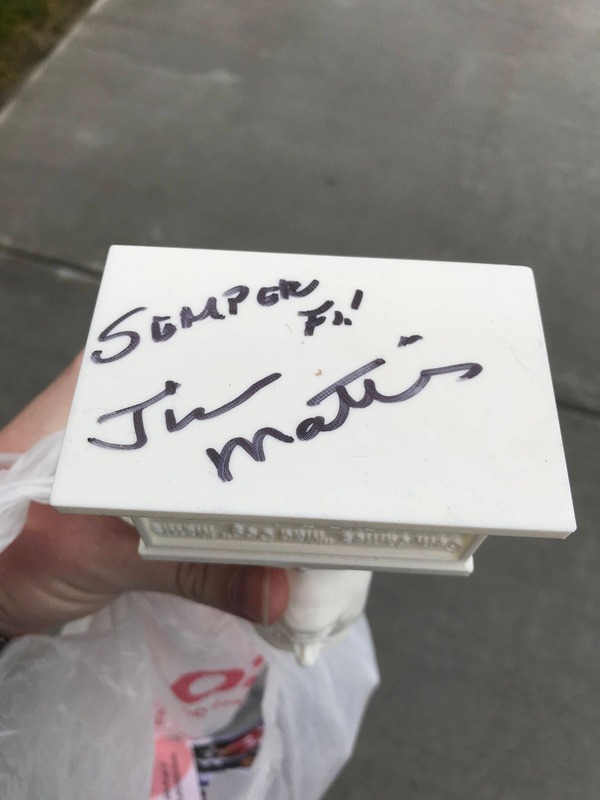 "James Norman Mattis (born September 8, 1950) is the 26th and current United States Secretary of Defense, serving in the Trump Administration. 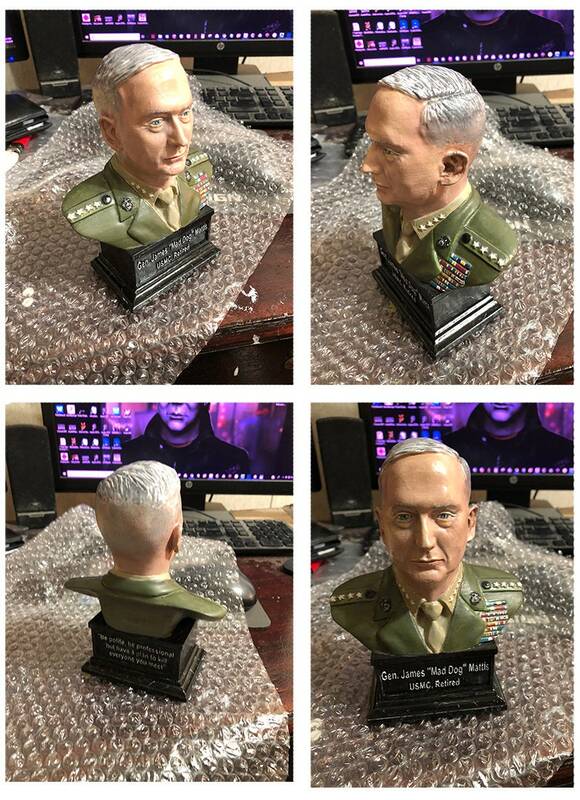 Mattis is a retired United States Marine Corps general who previously served as the 11th Commander of United States Central Command and was responsible for American military operations in the Middle East, Northeast Africa, and Central Asia, from August 11, 2010, to March 22, 2013. Before President Barack Obama appointed him to replace General David Petraeus on August 11, 2010, Mattis previously commanded United States Joint Forces Command from November 9, 2007, to August 2010 and served concurrently as NATO's Supreme Allied Commander Transformation from November 9, 2007, to September 8, 2009. Prior to that, he commanded I Marine Expeditionary Force, United States Marine Forces Central Command, and 1st Marine Division during the Iraq War. 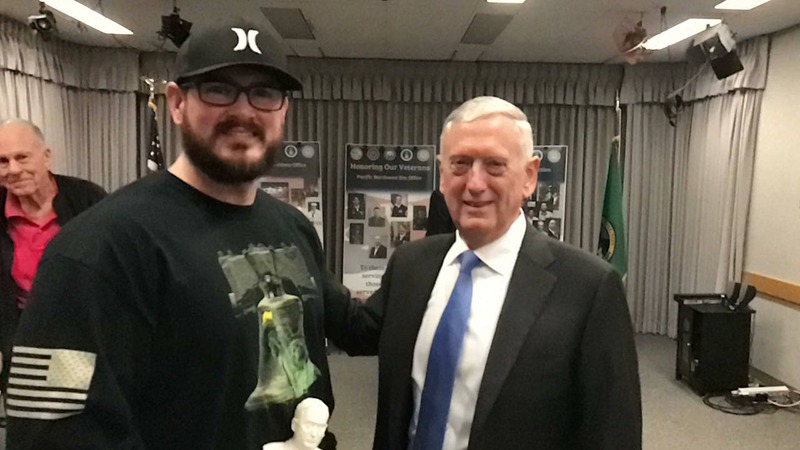 On January 20, 2017, Mattis was confirmed as Secretary of Defense 98–1 by the United States Senate on a waiver, as he had only been three years out of active duty despite US federal law requiring a seven-year cooling off period for retired military personnel to be appointed Secretary of Defense. He was the first member of President Donald Trump's cabinet to be confirmed." Every item in my shop is test printed and checked for not only aesthetics, but also the intended use. All of my items I list I personally test to ensure they meet my stringent standards. 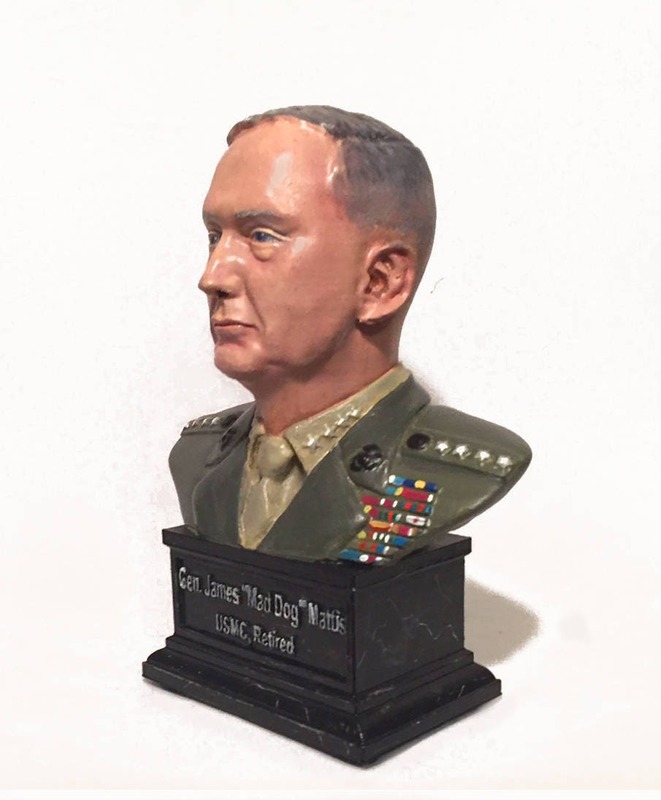 This bust is made of PVB, a 3D print-able vinyl variant that dissolves in alcohol, giving the model a nice glazed finish. It almost looks like it has been cast in ceramic and given a clear glaze.